A Collins John brace helped Fulham come from behind to consign 10-man Sunderland to their 16th league defeat. Sunderland started brightly when Liam Lawrence fired home a left-foot volley from 20 yards after just seven minutes. But John found the equaliser just before the break, heading home Brian McBride's flick-on. In the 58th minute, defender Steven Caldwell was sent off for bringing down Heidar Helguson, who crossed for John to head in the winner soon after. Rooted to the bottom of the Premiership table on six points, Sunderland have struggled to get goals on their return to the Premiership this season. Danny Collins sent in a seemingy innocuous cross from the left but Knight's attempted clearance fell into the path of Lawrence, who fired home his second goal of the season. Fulham attacked the other end with some vigour with Papa Bouba Diop coming close when he failed to connect with Luis Boa Morte's square ball at the far post. But the west London outfit rarely challenged Sunderland keeper Kelvin Davis until John's equaliser two minutes before the break. With some surprise, the goal came shortly after the home side lost star midfielder Diop who was still struggling with injury and replaced by Helguson in the 40th minute. Three minutes later, Tomasz Radzinski crossed to McBride on the edge of the box with the striker's flicked-on header finding John who prodded home his first of the day. Caldwell added to Sunderland's misery shortly before the hour mark with his sending off for a professional foul on Helguson. The visitors were fortunate to narrowly avoid handing Fulham a penalty as Caldwell charged down Helguson just outside the area. Helguson crossed from the left to the far post, where John drifted between Gary Breen and Julio Arca and headed in at the right corner. Sunderland valiantly tried to create chances and were unlucky when Lawrence and Jonathan Stead, still seeking his first goal for the club, both shot wide. Keeper Davis also did well to keep out a McBride free-kick with a fine fingertip save but his efforts were to no avail as Fulham picked up the much-needed three points. "I don't think it was a great performance from us in terms of quality of possession but we showed courage. "It was a scrappy game, a battle, but they held strong and I was delighted with them." "In terms of his work-rate, I don't think Collins John had a good game, but he hit the back of the net twice and that's what he does best." "I think it's a bit harsh. If it was a free-kick, you could understand it, but he's not intentionally brought him down. "It's not a professional foul and I think it's the striker's movement that caused it. "Steven Caldwell clipped his legs but that's the striker running across him." 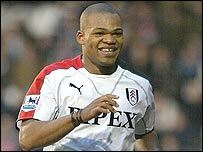 Fulham: Warner, Leacock, Pearce, Knight, Rosenior (Niclas Jensen 75), Boa Morte, Diop (Helguson 40), Legwinski, Radzinski, McBride, John (Malbranque 69). Subs Not Used: Drobny, Rehman. Sunderland: Davis, Hoyte (Murphy 64), Breen, Caldwell, Arca, Lawrence, Whitehead, Collins, Le Tallec (Nosworthy 64), Stead (Gray 65), Miller. Subs Not Used: Alnwick, Woods.